The Law of Attraction is the universal principle by which we actually create our personal (and to some extent our collective) reality based on our thoughts and feelings. The content of our thoughts and feelings includes expectations, beliefs and desires, and much of these are unconscious -- that is -- we are not aware of them. 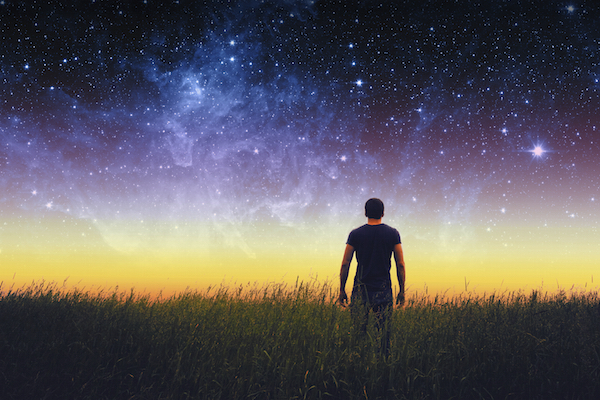 Unconscious thoughts or beliefs have just as much, and often more influence over our present experiences than our conscious thoughts and feelings do -- and they often contradict what we think we know about ourselves. That's the tricky part, and the area that psychotherapy or meditation can help with. We have heard various teachings on Law of Attraction for ages, from spiritual traditions, religious doctrine, motivational speakers, psychologists, saints and sages, and powerful inovative figures throughout history. But most of us have only taken it in at a superficial level. It's "a nice idea, but doesn't apply to the real world." Or we think, "it may work for some people but it doesn't apply to me." The most popular, mainstream level at which this concept is accepted is the "self-fulfilling prophecy." The idea that our expectations influence the outcome, or "you get what you expect." Of course, while we can see truth in this, it often doesn't hold up under scrutiny. We don't always get what we expect, and in fact, when life doesn't turn out as well as we expected it to, we often get depressed or resentful. It's not only our expectations, but our beliefs and our energy level that influence what we attract into our lives. Much of this can be unconscious. To accept that you are an active participant in the creation of your life requires a huge shift in identity. It means taking complete responsibility for your experience. There can't be any more blaming or seeking answers outside of yourself. The Law of Attraction is common sense. At the most basic level, a violent person attracts other violent people. A peaceful person attracts peaceful people. A paranoid person attracts suspicious people and events that validate their reasons for being paranoid. A drug addict can find drugs anywhere -- it's as if they practically fall in their lap. A woman who has been abused as a child will often attract only those men who turn out later to be abusive (even though they had no conscious knowledge of this when she met them). So why do bad things happen to good people? What about children? What about people dying of starvation in Africa? The Law of Attraction does not explain every aspect of the human condition. And I don't presume to be able to answer these age old questions. The Law of Attraction is not a cure all, or a replacement for sound common sense, compassion, hard work, and spiritual practice. Furthermore our minds are complex, and life is not black and white. We just can't account for every variable - every subconscious and unconscious thought, feeling and belief that we hold. We have dark places inside us, where fear lurks, self-doubt, anger, guilt, shame, hopelessness, self-defeating beliefs and expectations of doom and failure. This does not mean that we want bad things to happen, or that we are asking for trouble. Even great saints sometimes get sick. Those people who are hugely successful -- be they famous, or wealthy, or creative or influential, aren't so different than anyone else -- except for their drive, concentration, and belief that they can be what they want to be. Some people reach great heights because they grew up in an environment of abundance, where they automatically learned to expect good things in life -- there simply was no belief in limitations. Others may have faced extreme adversity, but through grace and some positive influence from someone, found within themselves a determination to transcend their circumstances. In either case, many of these successful people had no knowledge of the Law of Attraction. They may have attributed their success to hard work, ambition, luck, faith, God, good karma, intelligence -- whatever. But the fact is, through consistent, concentrated intent, a calm, self-assured expectation of success (confidence), and a clear goal - a clear and consistent desire -- manifestation of success was the inevitable and predictable result. The Law of Attraction exists because at the quantum level, the deepest truth is that nothing is really physical. The energy that makes up your body's atoms, is part of the cosmic ocean that contains all matter and space. There is no separation of mind and body. Inner and outer are One. Even basic science has demonstrated that thoughts are energy. Thoughts play a direct role in the creation of life as we know it. The work lies in identifying what it is that you really want (not always so easy to do); removing the negative, self-limiting thoughts or beliefs from the mind (even harder to do); and concentrating on that which you desire - with certainty, clearly visualizing having that thing, being that person. You have to feel it in your imagination and in your body as if it's here now. Then let go and trust that it will come to pass at just the right time and in the right way. It's not your job to figure out how. As soon as we think about the potential obstacles to getting something, we fall into duality - thinking of how we can't get what we want, or what could go wrong - we create limits. In my experience, energy psychology (like EFT), and meditation are the most powerful and fastest method for clearing the clutter of the negative mind. And thus removing the ambivalence, self-doubt, and over-intellectualization, allows us to become a magnet for the positive things we really do want. These are the perfect tools for consciously realizing the Law of Attraction in your life. Always focus your goals in the positive. Not the negative. Never dwell on what you don't want. Just focus on what you DO want. Becoming overly focused on problems, creates more problems. Focusing on solutions, creates solutions. I don't feel that anyone should ever be blamed for their suffering. This is the mentality that allows us to look the other way while holocausts take place. We are all here to learn to love one another and there is no place for blame, judgement or condemnation -- either of ourselves, or of anyone else. The Buddha's core teachings were very simply stated. The first of the four noble truths was this: Life is Suffering. The second truth: Attachment (or resistance, or fear, or desire, or non-acceptance, or judgement) is the cause of our suffering. (And fortunately, there are ways to liberate yourself from suffering). "If you judge people, you have no time to love them. Let us more and more insist on raising funds of love, of kindness, of understanding, of peace. Money will come if we seek first the Kingdom of God - the rest will be given." There is unspeakable pain and suffering in this world. Children are born into lives of abuse, pain, neglect and cruelty. Good people get sick and suffer tremendous physical and emotional pain. Does this mean that the law of attraction is all nonsense? Victor Frankle, a Holocaust survivor, theorist, author and psychiatrist, says that disappointment, or loss of hope was one of the surest things that would bring about a quick death for many prisoners in the concentration camps. We create our own meaning. All I know is that in my own experience, when I am willing to look clearly at my beliefs, my expectations and the life that I am living -- I can see abundant evidence for the the law of attraction at work in my life. I don't claim to have the answers to life's questions, or to explain the existence that forms the human condition we all share. Start with an open mind. Recognize that you have far more power than you think you do. Dare to believe that you deserve to have good things and that good things can come to you in this life, and experiment.